Turks and Caicos is an archipelago of low coral islands lined with crystal clear water and white sand beaches that will you breathless. Start planning your Turks and Caicos honeymoon here. A Turks and Caicos honeymoon is perfect for couples looking to find tranquility and the absence of crowds and bustle from other famed beach resorts. 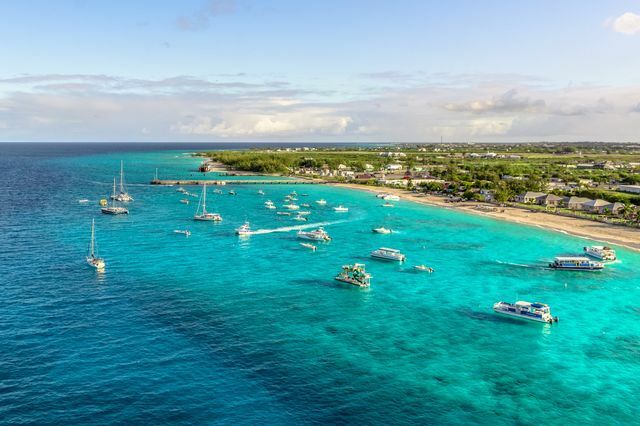 These islands and cays are blissfully laid back, unpolluted and natural despite the development of upscale resorts along Grace Bay on Providenciales, often shortened to ‘Provo’. This is the place to enjoy a romantic stroll at sunset, locally made beer or rum and some delicious fresh caught seafood. Barefoot beach bars set the tone for the nightlife here. There are no chains and big box stores, only small local shops offering a variety of crafts, art and beach style fashion. It’s a sunbather’s paradise with hundreds of kilometers of pristine sandy shores. For more adventurous couples, the beaches are marbled with snorkeling opportunities and the reef barrier north of the islands boasts exceptional dive sites, including a massive 7000 foot drop off. A Turks and Caicos honeymoon is sure to take your breath away—learn more about this incredible destination. The climate on Turks and Caicos is ideal and breezy year round. The busy high season is between December and April. Costs, especially for Turks and Caicos resorts, tend to rise significantly during this time. The Atlantic hurricane season hovers around late summer and early autumn. Sunset at Grace Bay Beach: End a romantic walk with a beach bar cocktail. Night time boat cruise to Caicos Cays: Witness the glowworms following a full moon. Snorkel adventure: Learn to dive for conch and explore the colorful reef. Salt Cay: Wander around this laid back spot with colonial charm on foot. Offshore fishing: Book a private charter for an exciting deep sea fishing experience during your Turks and Caicos honeymoon. Malcolm’s Beach: Rent a 4x4 and venture off to this secluded beach paradise. Whale watching tour: See humpback whales as they migrate between January and April. Scuba diving: The archipelago features the world’s third largest reef system and diverse marine life. Beach massage on Grand Turk: Relax and let your worries drift away with the breeze. Private sunset cruise: The ultimate romantic sailing cruise—ideal for a Turks and Caicos honeymoon. Food tour in Providenciales: Discover the local flavors and sample fresh caught seafood. Kayak Chalk Sound National Park: This pristine lagoon is as turquoise as it gets.